A bit earlier than expected, we have to release vm3.0.4 to close a vulnerability in the core. This is a real vulnerability, no exploit. The problem is a wrong error report setting, which can reveal the used server path for the real attack. More and more people use php5.4 or php5.5, which has another default error handling and so they sometimes displayed Strict Errors (revealing the path). To prevent this, we added a function to disable the "Strict Standards" reporting for the "default" and "none" setting in Joomla. Unluckily, we left for a special debugging case the setting on enabled. So regardless the used configuration setting, you always got at least the "Simple" setting. Luckily it is not so easy to create warnings and errors in VirtueMart 3.
open the file config.php at /administrator/components/com_virtuemart/helpers/config.php. Or just download the new version. The layout changes of the new version are just one important one for people who override the sublayout prices. The sublayout prices.php had a <div class="clear"></div> at the end, which got removed to increase the flexibility of the sublayout. The new version contains a new sample product, the "child variant", which allows you to use up to 5 dropdowns to determine the product variant. It is similar to the stockable plugin, but allows also changing the variant data of any child directly from the parent. The handling of the feature is not perfect yet, but a good start. Feel free to share your ideas on our forum. We are pleased to announce the release of VirtueMart 2.6.14 and VirtueMart 3.0.2. 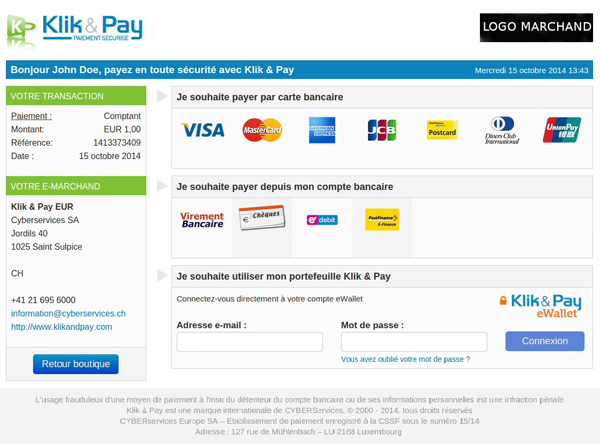 If you already have a Klik & Pay merchant account, you can directly set it up using our payment plugin Klik & Pay provided in VirtueMart. Compatible with Joomla 2.5 and Joomla 3, the new generation of the eCommerce solution VirtueMart is now available with many new easing features. Built with the experience of more than 10 years VirtueMart 3 provides you with a powerful and comprehensive eCommerce solution. We give you a flavour of the work we have done to provide you with one of the best open-source e-commerce solution around! This new generation of the ecommerce platform VirtueMart includes many new features under the hood and is a continuous development of VM2. Our main focus was to make it compatible with Joomla 3, cleaning the architecture, increasing the stability, and increasing the performance. In short: looking superficially at VirtueMart 3 it looks and works almost as VM2, but the feeling and handling is different. Thousands of man hours have been spent and countless changes have been done updating and enhancing VirtueMart. We are happy and thank the many dedicated developers and store owners that helped to test and provide positive feedback on this most recent version. VM2 to VM3 is an upgrade, implemented using the Joomla install manager - it does not require a migration (as was the case for VM1 to VM2). We have maintained as much compatibility as possible with VM2 but we have had to make some changes in order to deliver the improvements in VM3. 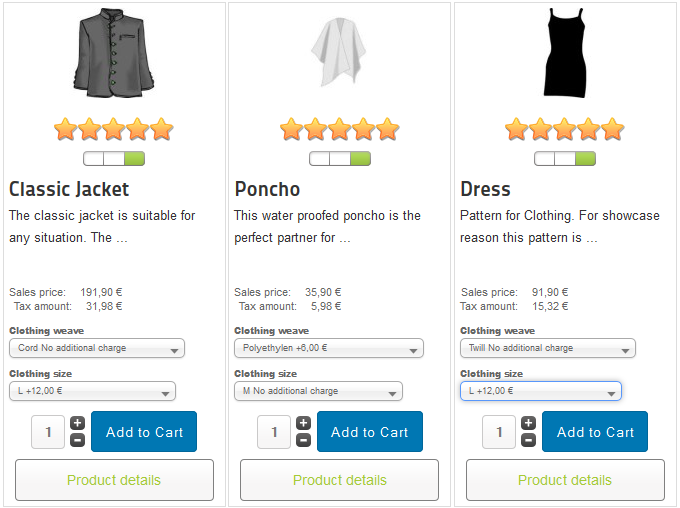 Shoppers will be delighted by the enhanced speed, add to cart buttons in the category browse view, and simpler checkout. Shop owners will notice the enhanced backend speed and simplified customfields. Shop builders will find a lot more tools to fulfill the wishes of their customers. New internal program caches reduce the sql queries for the most used tasks by more than 25%. Heavy functions are additional cached with the Joomla cache. The new core has an advanced cart with enhancements to provide better update compatibility. For example the new custom userfields include now an option to be displayed on the checkout page and can use their own overridable mini layouts, making it easy to adjust the cart to legal requirements without touching the template. The data stored in the session is minified, which can be easily modified by plugins (for example to adjust the weight). The cart is automatically stored for registered users. The cart checks also for any reload of the available quantity of the items and corrects it if needed. You can re-use your layouts by using the new sublayouts (like minilayouts). They give your store a consistent appearance and make it easier to adjust standards for different layouts in one overridable file. The input data is very unified which makes it stable against updates. This is very handy for the native "add to cart" button and customfields in the category browse view. New parameters in the Joomla menu settings for virtuemart views and modules provide more flexibility and better joomla integration. Frontend managing combined with the Joomla ACL now allows your vendors to directly access the VirtueMart backend from the frontend, without having access to the Joomla backend. The system now provides different modes for different multivendor systems. VM3 is now prepared to work with a sales team, or shipment team. We reduced the dependencies on Joomla, but increased on the other hand the integration. For example, the core now uses only the JFormFields of Joomla 2.5 and not any longer the old vmParameter, but we added vRequest (MIT) as choice for JInput. Developers can now use the normal JFormField joomla conventions for all plugins. With new options, redesigned and a lot more flexible to use. In VM2 you had to override none or all customfields of the parent. In VirtueMart 3 you can disable or override each customfield independent of the others. This makes creation of product variants a lot easier and faster. The new child variants gives the possibility to display products with up to 5 rambifications (can be increased), which depend on each other. Very important is also the new behaviour that you can use one customtype as often you want for one product. "Additional Shoppergroup" is a new feature for shoppergroups, which does not replace the default groups. This is very handy if you use the default shoppergroups for calculation. The new jQuery versions are now mainly the same as in Joomla 3.3 (jQuery v1.11.0,jQuery UI - v1.9.2, legacy complete). Shops using Joomla 2.5 with VirtueMart 3 also benefit from this. It prevents needless configuration problems. All changes in the API have been deeply tested and most 3rd party developers have updated their extensions already. The whole core and extensions are now working with the new abstraction layer (vmText, vRequest,...). Please visit http://extensions.virtuemart.net for updates of your extensions. Reduced jQuery conflicts as we now mainly implement the same as Joomla 3.4 (jQuery v1.11.0,jQuery UI - v1.9.2, legacy complete). Please read http://docs.virtuemart.net/tutorials/installation-migration-upgrade/198-upgrade-virtuemart-2-to-virtuemart-3.html for additional information. If you like what we do, consider supporting us with a Membership. Realex Payments, one of Europe’s fastest growing payment solution providers, is delighted with its latest integration with Virtuemart, the free online shop solution. The integration with Virtuemart provides ecommerce merchants with a one-stop solution for merchant online payment processing. To mark this latest release, Realex Payments are offering 2 months FREE payment processing to all new VirtueMart merchants to their platform. Improve your online conversions with Realex Payments’ latest shopping cart integration with VirtueMart. Realex Payments are offering 2 months FREE payment processing to all new VirtueMart merchants to their platform. We release VirtueMart 3 next week. You have not tested yet? it is time to do it. You think you found a bug? please report it on the forum. Your are a 3rd party VirtueMart developer? Test your extension against the new version. Readded to continue_link_html the class in the link class="continue continue_link"
Added option reuseorders, also settable by config file.